The Mayor of London and the Smart London Board will have a major presence at #SCEWC16 November 15-17, 2016. Around a central theme of London: Data City, they want to show the world how ‘smart’ London is. They will explain that they have partners from a range of sectors crossing a range of disciplines connected to data, analytics, and smart technologies. Along with the scale-ups in the Mayor’s International Business Programme and their partners, the London Borough of Camden, Digital Greenwich, WiFi SPARK, NFC Ring, Spacehive, Blockdox, Smart Energy GB, Imperial College London Data Science Institute, and Mastodon C they will be telling this world-beating story to more than 1,400 international delegates and the 48 cities and countries going to Barcelona next week. The Mayor, of course, wants Londoners and businesses to be part of world-leading ideas that make London a smart city. Londoners generate data that helps the city manage its transport, social, economic and environmental systems. A prime example of this is the Oyster card, a contact-less card for travel across all London transport, which has given TfL an immense amount of detailed data about passenger travel across the network for the last 13 years. At the London stand, they will have a range of presentations each day, ranging from remarks from politicians to the companies and startups that support and drive the tech ecosystem in London. 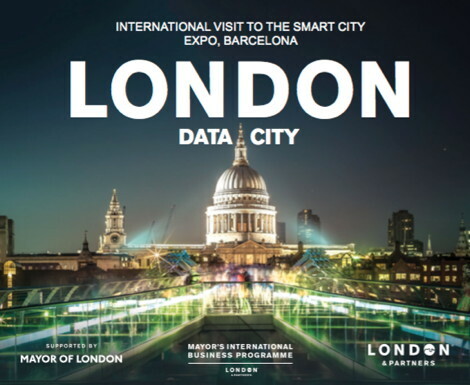 You can download (as a PDF) ‘London: Data City – the Mayor’s brochure for the Smart City Expo 2016′ here. This entry was posted on Monday, November 7th, 2016 at 09:08 @422 and is filed under DailyDOOH Update. You can follow any responses to this entry through the RSS 2.0 feed. You can leave a response, or trackback from your own site.